Cape Rey opened its doors as The Hilton Carlsbad Oceanfront Resort & Spa in June of 2012. Today at Cape Rey, guests experience a thoroughly modern hotel—built the way late nineteenth century masters of the California craftsman style would build it today. 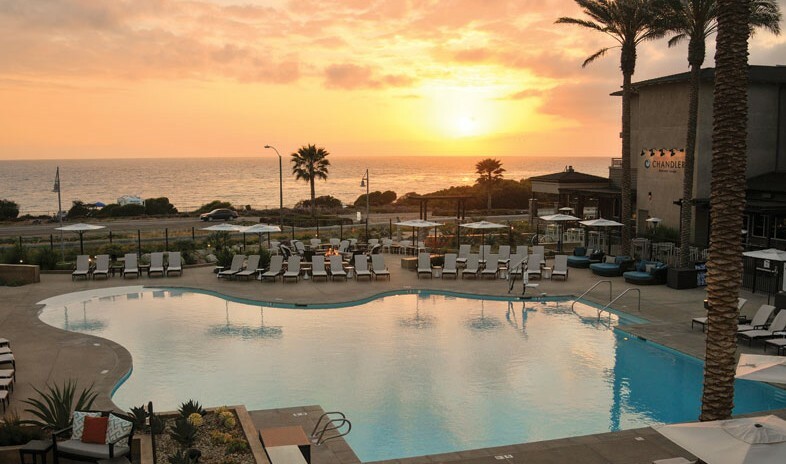 Tucked along the coast in north San Diego County, in the laid-back town of Carlsbad, California, the resort claims eight prime acres across the street from Ponto, a legendary surf break off Carlsbad State Beach. Sweeping ocean views accompany every aspect of guests’ stay. The grounds center on a Pacific-view pool with cabanas and fire pit, then radiate out to encompass 215 luxury lodgings, a full-service spa and fitness center, and Chandler’s, a modern-day classic for farm-to-table and sea-to-table cuisine, premium wines, and top-shelf spirits. The resort also devotes 25,000 square feet to meetings and events, including 10,500 square feet for outdoor receptions of up to 500 people. Inside, the hotel shelters 4,000 square feet of flexible prefunction space, which leads to an oceanfront ballroom seating up to 600 theater-style or dividing into five separate rooms. The location affords not only a quiet retreat by the sea but also a perfect base for exploring greater San Diego. Within minutes, attendees can be shooting the curl across the street, teeing off at Aviara Golf Club, reveling in the wonders of Legoland, or launching a caravan safari at the San Diego Zoo Safari Park. Our meeting experience at the Hilton Carlsbad Oceanfront Resort and Spa was outstanding. It's a brand new property with an excellent staff and wonderful accommodations. The hotel staff did a superb job of taking care of our group. Going out of their way to meet our needs was nothing out of the ordinary, it's just what they do. You will not be disappointed when you host your meetings here. I highly recommend this property! I have had the best experience working with the Hilton staff for all our meetings, they have provided customer service that is above and beyond. The entire property has a excellent aesthetic, there is a large variety of meeting space options and best of all the ocean views and access to the beach can't be beat!